John Kelly: Trust Levels of News Sources. Trust Levels of News Sources. I caught this on Twitter yesterday, and found it revealing. The Pew Research Center (previously came up here and here) conducted a survey across the United States to determine which media sources are the most trusted. However, the researchers introduced nuance into their model, by investigating the ideological identification of the respondents. One irony of the survey is that the sources that Americans trust the most are the Economist (a British newspaper masquerading as a magazine) and the BBC (the British Broadcasting Corporation). 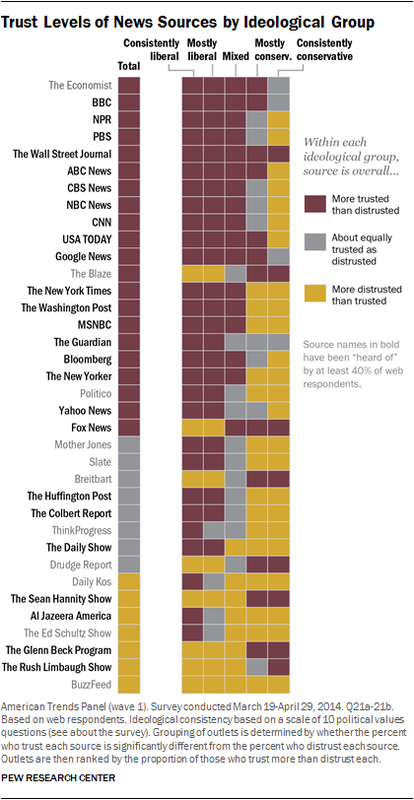 The most trusted American sources are NPR and PBS, followed by the Wall Street Journal (which happens to be the only publication more trusted than not across the spectrum). One interesting feature is the "hard shift" in this table, where the spectrum doesn't gradually adjust from one side to the other through the "equally trusted and distrusted" data point, and instead goes right to "distrusted" -- and where the "mixed" group also distrusts the source. There are only three -- The Daily Show, Sean Hannity, and Glenn Beck.